Femoral fractures account for 35% of pelvic limb fractures and 24% of all fractures in dogs and cats . The majority of femoral fractures require open reduction and internal fixation. Proximity of the abdominal wall medially and the large femoral muscle mass laterally reduces the potential use of external fixation techniques . A nonunion fracture refers to a fracture in which all evidence of osteogenic activity at the fracture site has ceased, fragment movement is present and union is no longer possible without surgical intervention . Nonunion following fracture repair has been reported to occur in 3.4% of all cases, with radial fractures affected most commonly (40.6%) followed by femoral fractures (38.5%) . Nonunion fractures can be further classified into biologically active or biologically inactive forms based on the osteogenic potential and vascularity of the fracture ends. Biologically active nonunion fractures have good vascularity and varying amounts of callus formation. Biologically inactive nonunion fractures have poor vascularity and little or no callus formation . A number of local factors may result in poor surgical results following fracture repair such as inadequate reduction and fixation, a large fracture gap or excessive soft tissue trauma with impairment of local blood supply . Infection also predisposes to nonunion of a fracture  and is often a complication of open reduction with the highest incidence reported in the femur [12, 32]. Treatment principles for nonunion fractures depend on whether they are biologically active or inactive. Biologically active nonunion fractures have the potential capacity to heal and generally only require rigid stabilisation. Biologically inactive nonunion fractures are much more challenging because the healing process must be reactivated. This requires debridement of the fracture ends to open the medullary canal, rigid stabilisation and implantation of a cancellous bone graft . If infection of the fracture site or osteomyelitis is present, aggressive surgical debridement and lavage, establishment of drainage, appropriate antibiosis and possible delayed cancellous bone grafting are required in addition to the rigid fragment stabilisation [15, 11]. Treatment can be prolonged, expensive and infection may recur . The angiogenic, immunogenic, adhesive and drainage properties of omentum have been successfully used in the treatment of many conditions in veterinary and human surgery [18, 2]. The ability to lengthen omentum as a vascular pedicle [3, 14] or transplant it as a free microvascular flap  has widened the range of applications in human surgery to include gastrointestinal, urogenital, thoracic, vascular, neurological and reconstructive procedures . Management of chronic osteomyelitis by omental microvascular transplantation has been reported  and omental pedicle transposition has been used to treat sternal osteomyelitis and mediastinitis [36, 26]. Omentalisation has been used in veterinary surgery for the treatment of prostatic abscessation, pyothorax, chronic axillary wounds in cats, chest wall defects and diaphragmatic hernias [10, 37]. To the authors' knowledge, omentalisation has not been previously described in the veterinary literature for the management of infected nonunion fractures involving long bones. This report describes the use of an omental pedicle extension for the treatment of a dog with an infected femoral nonunion fracture. A three-year-old, 16 kg border collie was presented with an acute non-weight bearing right pelvic limb lameness. The dog had suffered a closed, comminuted, mid-diaphyseal right femoral fracture eight months earlier. Two attempts had been made to surgically stabilise the femoral fracture. A type Ia external skeletal fixator was initially applied. This failed due to premature pin loosening and loss of stability six weeks postoperatively. A second surgery was then carried out. A plate-rod construct was employed using a 3.2 mm intramedullary pin and 3.5 mm dynamic compression plate. Aerobic and anaerobic bacterial culture at the time of the second surgery identified a multi-resistant Staphylococcus epidermidis. Appropriate antibiotic therapy was prescribed for 30 days. Craniocaudal radiograph of the right femur demonstrating fracture of the most distal two bone screws, intramedullary pin proximal migration and radiolucency surrounding the intramedullary pin and several screws (5th, 7th & 8th). There is an absence of mineralised callus. The changes are consistent with a biologically inactive femoral nonunion fracture, implant failure and suspected osteomyelitis. Twenty four hours later, the dog was premedicated with 0.05 mg/kg acepromazine maleate and 0.5 mg/kg morphine sulphate administered intramuscularly and anaesthesia was induced using 4 mg/kg of propofol administered intravenously (IV). Anaesthesia was maintained with isoflurane carried in oxygen. Epidural morphine at 0.1 mg/kg and 0.5% bupivicaine at 1.5 mg/kg were administered as part of the multi-modal perioperative analgesia. Perioperative amoxycillin-clavunate was administered IV at a dose of 20 mg/kg 30 minutes prior to surgery and repeated once after 90 minutes. Standard aseptic preparation of the ventral abdomen and a hanging limb preparation of the right pelvic limb were performed. The dog was positioned in dorsal recumbency and tilted towards the left to permit access for a standard ventral midline coeliotomy and a lateral approach to the right femur. A ventral midline coeliotomy was performed extending from the xiphoid to the umbilicus. A two-stage omental pedicle extension technique was performed . A 3 cm paramedian stab incision was made in the right abdominal wall 4 cm lateral to the prepuce through which the omentum was exteriorised and tunnelled subcutaneously to the cranial aspect of the right thigh. The coeliotomy was closed routinely. The right femur was exposed using a standard lateral approach . During the approach, the omental pedicle was brought cranial and lateral to the sartorius muscle and toward the fracture site. The fracture was grossly unstable and surrounded by abundant serosanginous fluid. Necrotic soft tissue was sharply debrided, but the fracture fragments were not disturbed. The intramedullary pin and the heads of the fractured screws in the distal fragment were removed and submitted for aerobic and anaerobic culture and antibiotic sensitivity testing. The screws in the proximal fragment were secure and the remaining distal screw was tightened. The bone plate was left as temporary stabilisation. The fracture site was lavaged with 4 L of warm sterile saline. The omental pedicle was loosely packed into the fracture gap taking care not to place it under tension. Surgical wound closure was routine with the exception that the fascia lata was incompletely closed in the proximal half of the wound to prevent vascular compromise of the omental pedicle . Analgesia was provided with a 50 μg/hr fentanyl skin patch (Duragesic; Janssen), 0.2 mg/kg IV morphine every four hours over a 24-hour period and meloxicam at 0.1 mg/kg once daily per os. Amoxicillin-clavulanate at 20 mg/kg twice daily per os was administered postoperatively pending culture results. A pure growth of Escherichia-coli was isolated from the removed implants. The sensitivity spectrum indicated a change to enrofloxacin. The dog was hospitalised for 10 days whilst awaiting the second stage of the procedure. 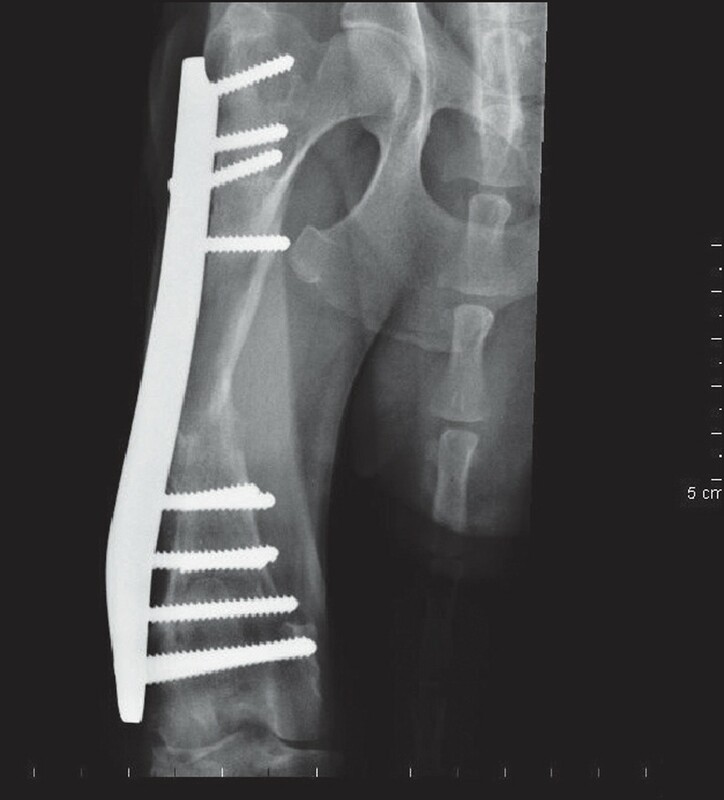 Exercise was restricted to four short lead walks daily given the tenuous nature of the temporary fracture stabilisation with just one plate screw in the distal fragment. Passive pelvic limb flexion and extension physiotherapy was performed four times daily. Ten days after the omentalisation procedure, the dog was anaesthetised as previously described. The right femur was approached through the previous lateral incision. The gross appearance of the fracture site was markedly improved. The omentum was viable and adhered to the fracture ends. There was abundant granulation tissue, an absence of necrotic tissue and no gross discharge evident. The plate and remaining screws were removed following gentle elevation of omentum from the lateral aspect of the femur. A 13 hole, 3.5 mm, broad supracondylar femoral bone plate (Veterinary Instrumentation, Sheffield UK) was applied to the lateral aspect of the femur. Ten cortices were achieved distally using five bicortical screws and eight cortices proximally using four bone screws. There were four vacant screw holes over the fracture site (Figure 2). A cancellous bone graft was harvested from the proximal right humerus using a separate set of surgical equipment. The graft was gently packed into the fracture site underneath the omentum. The wound was closed routinely and immediate postoperative radiographs were obtained. The analgesic regime was identical to that used after the first stage of the procedure. The dog was discharged five days postoperatively and the owner was asked to limit exercise to short controlled lead walks and to perform passive range of motion exercises of the stifle and hip joints four times daily. Enrofloxacin 5 mg/kg and meloxicam 0.1 mg/kg were continued once daily per os for a total of 30 days. 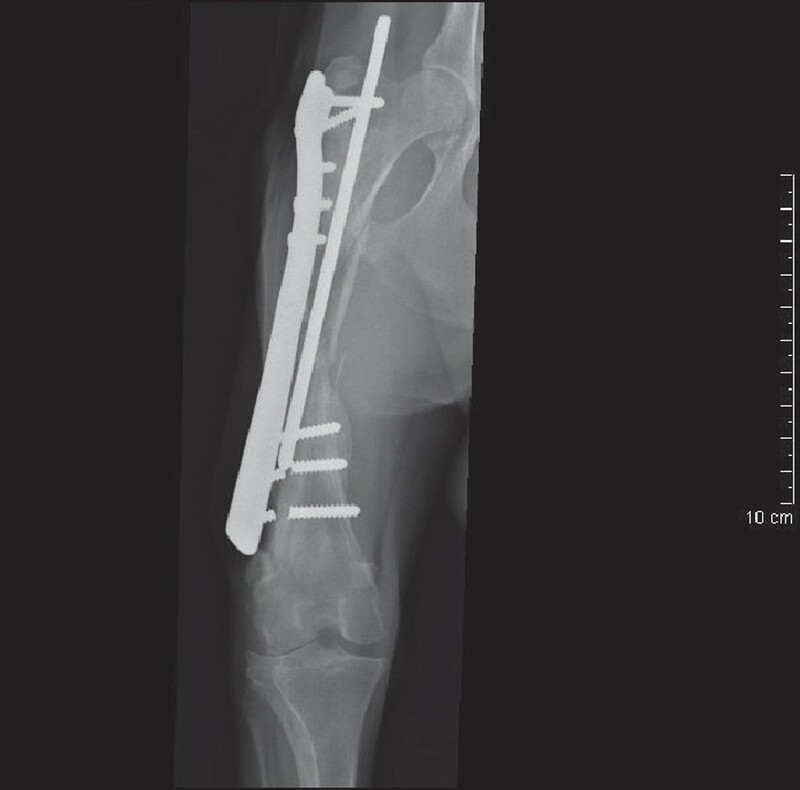 Intraoperative photograph showing the application of a 13 hole, 3.5 mm broad supracondylar femoral bone plate to the lateral aspect of the right femur to provide fracture stability. Four bicortical screws were placed in the proximal fragment and five in the distal fragment. The patient was re-examined at four weekly intervals for 16 weeks. On clinical examination four weeks postoperatively, the dog was consistently using the right pelvic limb and demonstrated a moderate weight bearing lameness. The muscle atrophy noted preoperatively remained. Orthogonal radiographs of the right femur revealed minimal bone reactivity when compared to the postoperative studies. At eight weeks, the lameness had improved and there was increased right thigh muscle mass but minimal radiographic changes remained. At 16 weeks, the dog demonstrated only a mild residual lameness and there was clinical and radiographic evidence of bone union (Figure 3). At one year, the owner reported the dog had returned to normal work without lameness. Sixteen week postoperative craniocaudal radiograph of the right femur demonstrating bone union. A diagnosis of a biologically inactive nonunion fracture in this case report was based on the absence of bone resorption or callus formation at the fracture site after a six-month period since fracture repair . A discharging sinus, radiolucency surrounding the intramedullary pin and several bone screws and a positive bacterial culture from the implants supported the diagnosis of osteomyelitis. It has been well-documented that fracture healing may occur despite the presence of infection, provided adequate fragment stability and vascularity exist . However, the radiolucency surrounding the implants, broken bone screws and the lack of mineralised callus at the fracture site suggested a lack of stability and vascularity in this case . Successful treatment of infected, biologically inactive nonunion fractures by en bloc ostectomy and stabilisation with a dynamic compression plate has been described . The main limitation of this technique is loss of bone length. This dog was not considered a suitable candidate for this technique because greater than 20% of the bone length was involved and dogs can only compensate for a 10-20% loss in femoral bone length . 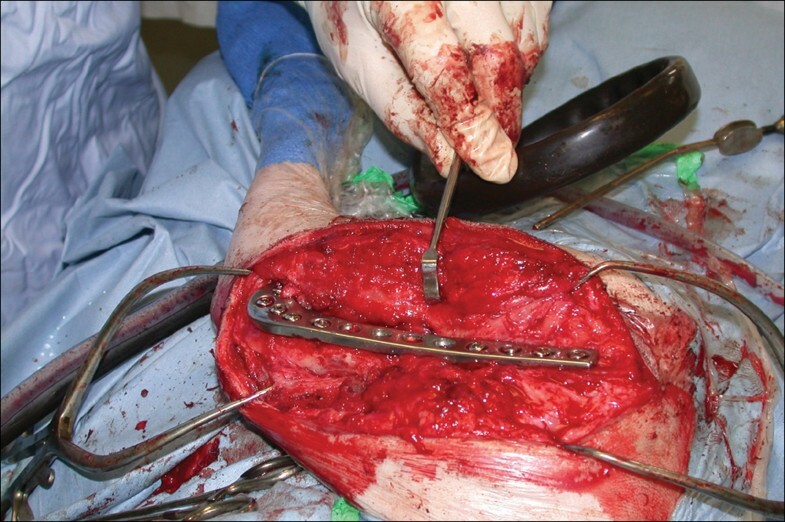 Treatment by open wound management and external skeletal fixation  was not considered appropriate in this case. The large lateral muscle mass associated with the femur would result in poor drainage and there would be significant soft tissue morbidity associated with pin placement . The presence of the abdominal wall medially limits the potential range of external fixation techniques and the clamps and connecting bar would be a significant distance from the bone, which would reduce the overall construct stability. Thus, the estimated healing time for this femoral fracture was expected to be greater than the time period an external skeletal fixator could provide stability . Radical debridement, lavage, drainage, antibiosis and restoration of stability with a bridging bone plate, combined with immediate or delayed cancellous bone grafting was a possible treatment option. This had the advantage of bone length retention. However, it was considered that there would be a high risk of continued fracture nonunion, or prolonged healing at best in the current case, because this option would do little to address the extremely poor vascularity of the fracture site or to reactivate the healing process. Even if successful fracture healing were attained, there would be the distinct possibility of recurrence of infection associated with the internal implants. Omentalisation of the fracture was a novel approach in an attempt to introduce a blood supply and encourage the formation of callus at the fracture site and to aid resolution of the infection. Vascular invasion of the fracture site is an essential component in bone healing [13, 38]. It has been shown that angiogenesis is mediated via vascular endothelial growth factor from the fracture haematoma . Abundant expression of vascular endothelial growth factor by omentum has been demonstrated  and this may explain the mechanism of omentum-induced revascularisation of the fracture site. In an experimental study using a rabbit model, omental grafting was demonstrated to have a positive effect on bone healing by augmentation of vasculogenesis . A two-stage surgical procedure was chosen over a singlestage procedure due to the gross infection evident at the fracture site during the initial surgery. This permitted omentum to become established at the fracture site, eliminate the major focus of infection and improve vascularity. It was then possible to perform definitive bone plate stabilisation and cancellous bone grafting in a biologically improved environment. Complete implant removal during the first stage was contemplated, but it was considered necessary to leave the bone plate in situ to maintain approximate femoral alignment and length. The broad supracondylar femoral bone plate was considered a suitable implant. It has advantageous mechanical properties that were beneficial considering the loads that it would be subjected to over an extended period of time whilst buttressing a large fracture gap . Additionally, its configuration permitted five bicortical screws to be placed in the distal fragment at a distance from the fracture site whilst avoiding the existing holes in the bone. The omentum is a dynamic organ with many additional properties that may have played a role in the successful outcome of this case. It has lymphoid clusters, which contain cells of lymphoid and myeloid origin that may have provided a cellular and humoral immune function . It filled dead space and produced a plentiful supply of fibrin facilitating adhesion that is essential for revascularisation  and provided drainage of the infected fracture site. The anatomy of canine omentum allows it to be extended as a pedicle flap to reach any part of the body and it is considered more robust than the microvascular transplantation of a free omental graft [28, 27]. It is, therefore, the preferred technique in veterinary surgery. One disadvantage associated with using an omental pedicle flap in this case, is the requirement to bring it through a long subcutaneous tunnel. This could potentially constrict the pedicle and compromise its blood supply. This was not clinically apparent at the second surgery. If vascular compromise is of concern, a bridging incision can be used to bring the pedicle from the abdominal exit hole to the femur . In our case report, the omentum was 'tacked' to the laparotomy exit wound. This technique is commonly performed in humans to prevent gastric pain following pedicle extension secondary to distortion of the gastric axis . However, this does not appear to be a concern in veterinary patients and anchorage of omentum may not be necessary  (Lascelles et al. 1998). Other potential complications exist. Abdominal contents may herniate through the abdominal exit wound with subsequent strangulation or incarceration . The exit point should be positioned dorsally within the abdomen to minimise this risk. Ascending infection along the omental pedicle and secondary peritonitis is another potential concern. However, it has been suggested that omentum forms a fibrin seal at the abdominal exit hole, which acts as a mechanical barrier to bacteria [18, 10]. The immunogenic properties of the omentum previously discussed may also play a role. Seroma formation in the graft bed has been reported  (Lascelles et al. 1998). This may occur secondary to venous or lymphatic vasculature collapse, necrosis of the omental fat or nonseptic inflammation . Although the adhesive properties of the omentum may have aided revascularisation and localisation of infection , there was a concern that it may form adhesions to surrounding traumatised tissues, particularly the quadriceps, which may have resulted in quadriceps 'tie down'. This complication was not observed and the omentum may in fact have acted like a sliding barrier preventing incorporation of the traumatised muscle into the fracture callus. The intensive physical therapy in the immediate postoperative period may also have played a role in the avoidance this complication. Considering the overall therapy employed in this clinical case and the variability that can be seen in the management of these cases, it is difficult to determine the exact contribution of the omentum. However, on subjective gross examination of the fracture site 10 days post omentalisation, the improvement in tissue viability and vascularity was dramatic. In addition, complete osseous union was present at 16 weeks post surgery. While expected healing times are difficult to predict in an individual case due to the many variables in bone healing, we consider this healing time to be relatively rapid given the poor biologic state of the fracture site at the time of the omentalisation. We consider that the adjunctive use of omentalisation in this case was a significant component in the successful resolution of a biologically inactive, infected nonunion fracture and was not associated with any apparent complications.